Why are Mitochondria the Key to Energy, Health, and Aging? How Do the Mitochondria Work? The “power plant” of your cells are vital to keeping your body running and your health in top form as you age—plus so much more. When you think of energy, a cup of coffee might come to mind. Or maybe a colorful can promising to give you wings. The last thing you might think of? Your body’s cells. But your energy is actually generated by the mitochondria, hundreds of organelles that live inside your body’s cells, working to take the food you eat and turn it into energy. Mitochondria are present in the cells of animals, plants, and almost every living thing with a complex cell structure—also known as eukaryotic cell, which has a nucleus. If your mitochondria are not functioning at their best, neither will you. And this is especially relevant as you age, when mitochondrial function starts to decline. 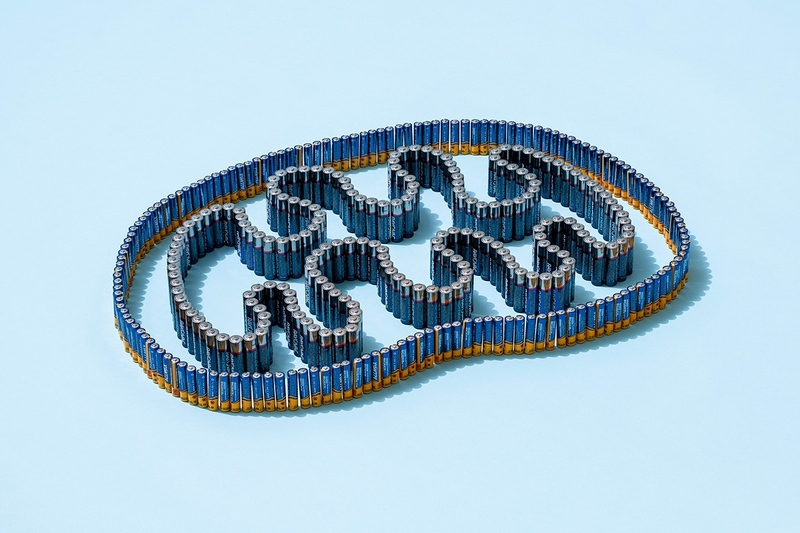 In fact, mitochondrial dysfunction has been identified as a hallmark of aging, with research linking it to diseases like Alzheimer’s, cancer, muscular dystrophy, diabetes, and more. As researchers have continued to identify mitochondrial function as more relevant to overall health, interest in the study of bioenergetics (how cells transform energy) has increased, particularly on new therapies and ways to keep the mitochondria as healthy and powerful as possible. Mitochondria most likely evolved from the engulfment of bacteria by other prokaryotic cells, with the internalized cell essentially providing the ATP that powered the other one. The mitochondria were initially called “bioblasts” or “life germs” by the German scientist Richard Altmann, in 1890, and were later renamed by microbiologist Carl Benda, from the Greek “mitos” or thread, and “chrondos,” granule. It wasn’t until the middle of the 1950s, however, that their true function was understood and their nickname “powerhouse of the cell” was introduced. Philip Siekevitz, in a 1957 Scientific American article, where mitochondria were first called the powerhouse of the cell. 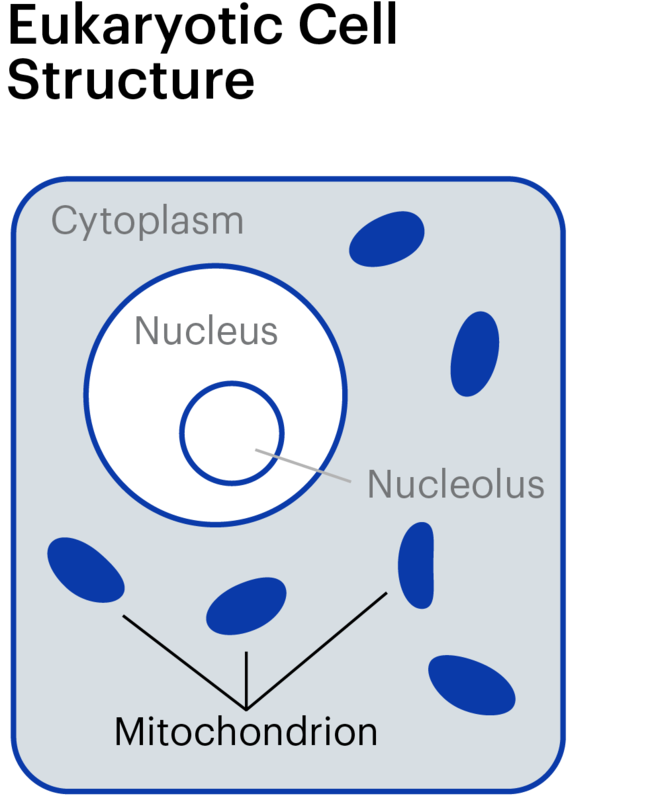 Some cells have more mitochondria and some have fewer, which can vary depending on how much energy that cell needs. They can be shaped like long, stiff cylinders, and are usually diagrammed that way, but they change shape, fuse with each other to form complex networks, and even separate again to create smaller discrete mitochondria depending on what the cell needs. Each mitochondrion has two separate membranes, called the inner and outer membranes, and a matrix, where folds, called cristae, live. The cristae are made from the inner membrane. So how does all this develop energy? Baur says the food you consume is reduced into component molecules that are imported into the mitochondria and burned to pump protons across the inner membrane, creating an electrical voltage. This voltage powers an enzyme called ATP synthase that turns like a rotor while generating molecules of ATP. This is the cell’s elegant process of creating energy, called cellular respiration, that converts sugar, fat, or protein molecules into usable energy for the cell. The first step in breaking down glucose is called glycolysis, which takes place in the cytoplasm of the cell. Glycolysis produces a molecule called pyruvate, which goes into the matrix of the mitochondria and is converted to another molecule called acetyl-CoA, which can enter the citric acid cycle (also known as the Krebs cycle). The result of this process is the conversion of the original pyruvate molecule into carbon dioxide and water, with most of the chemical energy captured in the form of high energy electrons that are bound to NAD+ (converting it to NADH). The electrons from NADH are donated to the electron transport chain in the inner membrane, regenerating NAD+ and powering a series of enzyme complexes that pump positively charged protons from the mitochondrial matrix to the outside of the inner membrane. In the final step of the electron transport chain, the electrons react with oxygen to create water – keeping this process running is the major reason we need to breathe oxygen. The electrical gradient created by electron transport powers ATP synthase, which is embedded in the inner membrane. Protons cross from the outside back into the matrix through ATP synthase, causing it to turn like a rotor and synthesize ATP, which can be used as a source of energy to power processes throughout the cell. So why does cellular respiration in the mitochondria matter? Well, there’s the obvious, which is that it’s how your body gets energy. But there’s also the not-so-obvious: Dysfunctional mitochondria are linked to aging and disease. Mitochondrial health can decline in a few ways. One long standing theory is that free radicals, a byproduct of the electron transport process, cause an increasing amount of damage to the mitochondria and cell. However, this theory has been reconsidered over the last decade, due to research in worms and mice that suggest free radicals aren’t always bad, and don’t always correlate with lifespan. Additionally, Baur says, genetic mutations from birth or accumulating with age can cause mitochondrial dysfunction directly, or by interfering with the processes responsible for quality control. One current focus of mitochondrial research links its decline to the lack of NAD+, a coenzyme found in all living cells that is vital to metabolism and hundreds of other biological processes. 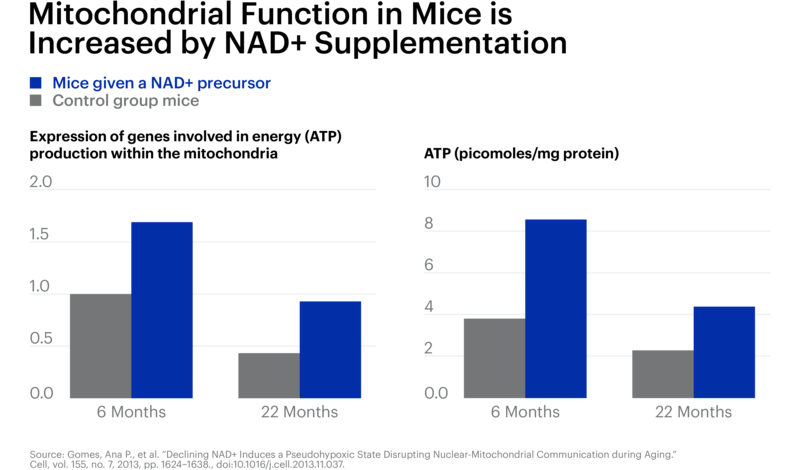 We know that NAD+ declines with age and that low levels of NAD+ are common in age-related diseased states. We also know that dysfunctional mitochondria are common in diseased states and that mitochondria become inefficient with age. Studies in animals have also shown that increasing NAD+ levels can restore mitochondrial function. Scientists are researching how to improve mitochondrial function. One way is with calorie restriction, the process of drastically restricting calories (and by drastic, we mean by a quarter to as much as half of your normal diet). Calorie restriction has been shown in animals to increase longevity and delay the onset of age-related disease. Calorie restriction also delays the onset of mitochondrial dysfunction, Baur says, and might reduce production of free radicals (though the free radical theory is still up for debate). But some evidence suggests that there's another way to improve mitochondrial function and it doesn’t require drastic dietary changes: NAD+ supplementation. NAD+ supplements, like Basis, contain nicotinamide riboside, or NR, the most efficient NAD+ precursor. NR can give your cells, and thus, your mitochondria, an essential factor that they need to create energy. If mitochondria are the power plants of the cell, the NAD+ is the keys that open the doors to the power plant. For example, a 2012 study in mouse models of diabetes found NR supplementation enhanced mitochondrial function, and a 2018 study in fly models of Parkinson’s disease found that NR supplementation in neurons “reverts mitochondrial defects,” with clear images showing the amount of cristae in the mitochondria with and without NR supplementation. And in another study, improving mitochondrial function in mouse models of Alzheimer’s also improved brain function. So can boosting mitochondrial health improve overall health? Animal studies suggest that the answer is yes, but more research is needed in humans. As researchers continue to identify exactly what therapies can lead to healthier mitochondria, and to study them in humans, the mitochondria may very well be a major focus in health and aging. Sirtuins help regulate your cellular health and play a role in aging. Here’s what you need to know about how they work.